Japan has positioned the MDGs as one of the important pillars of its assistance policies. Japan's Official Development Assistance Charter (hereafter, ODA Charter), which constitutes the basis of Japan's official development assistance ( ODA ) policies, positions poverty reduction as a priority issue. Similarly, the Medium-Term Policy on Official Development Assistance (hereafter, the Medium-Term Policy on ODA) newly established in February 2005 states clearly that Japan will make an active contribution to achieving the MDGs. Accordingly, Japan is making efforts toward achieving the MDGs in line with both the ODA Charter and the Medium-Term Policy on ODA, which forms the framework for Japan's ODA policies. The development of developing countries requires comprehensive measures such as fostering human resources, political stability, establishing and improving the investment environment, and promoting democratization. 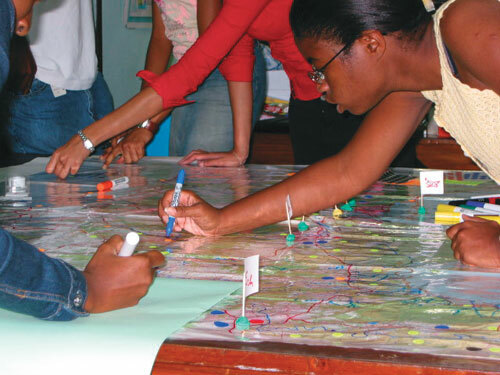 To implement these measures, the government of the developing country should play an important role, with the involvement of civil society and the private sector, to formulate its own development strategies and take measures in the areas of public finance and funding for these measures described above. Japan believes that ownership (self-help efforts) of the developing country is key to achieving the MDGs, such as establishing a stable domestic institutional and policy environment, human resources development, good governance, sound macroeconomic policy administration, and mobilization of domestic flows. It is the partnerships in the international community, including bilateral donors, international organizations, and Non-Government Organizations ( NGOs ), which support the ownership of the developing country. The general principles of ownership and partnership are incorporated in the IDGs, the precursor to the MDGs, and are today passed along as a characteristic of the MDGs. 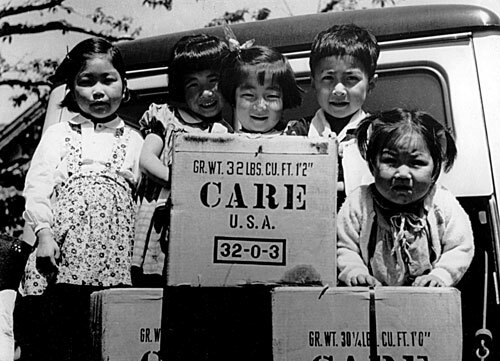 Goods sent from the CARE. Post-war reconstruction of Japan was supported by international community. Regarding the support it has provided to East Asia, Japan has provided support to the recipient countries on a request-oriented basis, so as not to force Japan's views on them; thus, Japan has implemented appropriate support. Furthermore Japan's support in the areas of policy implementation, human resources development, and the establishment of institutions has led to a strengthening of ownership of recipient countries, which has played a major role in economic development of East Asia. This is one reason why Japan places such an emphasis on the ownership by developing countries in order to achieve the MDGs. An example of Japan's contribution to foster the ownership of developing countries and partnership among the international community is the Tokyo International Conference on African Development ( TICAD ) *2 . Under the leadership of the Japanese government, the TICAD process has contributed to the strengthening of ownership among African countries whereby it triggered the establishment of the New Partnership for Africa's Development ( NEPAD ) *3 in 2001 and the inauguration of the African Union ( AU ) *4 in 2002. 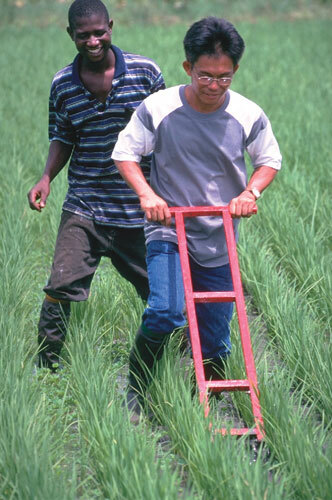 A specific example of ownership and partnership among developing countries is the South-South Cooperation. The South-South Cooperation refers to assistance provided by developing countries in comparatively advanced countries to developing countries which have not progressed as well. The South-South Cooperation enables smoother transfers of suitable technology to the recipient countries because various development requirements are similar between donor countries and recipient countries, such as the natural environment, culture, social circumstances, and stage of economic development. Japan actively supports the South-South Cooperation as a means to advance the development of developing countries in an effective and efficient manner by promoting ownership and partnership among developing countries. (2)The Perspective of "Human Security"
Human security is a concept that places emphasis on every individual in order to protect them from threats against their lives, livelihoods, and dignity, and to help them fulfill their abundant potential. Furthermore, it emphasizes the importance of "protection" and "empowerment." In other words, human security seeks to protect individuals from "fears" such as conflict, spread of infectious diseases, destruction of environment, and natural disasters, and the "threats" such as poverty, hunger, and lack of educational and health care services. It also aims to strengthen people's ability to choose and take action against threats on their own. In order to effectively assist the people living in poverty, who should be the main beneficiaries of MDGs, it is important to comprehensively understand the problems threatening people and cooperate toward finding a solution by taking into account of the concept of human security. For instance, in developing countries, 88 out of 1,000 children die before the age of five. Furthermore, the number of people who suffer from chronic malnutrition amounts to 17 percent of the entire population of developing countries. 3 In order to realize the concept of human security, Japan pursues aid policy with an emphasis on the "protection" and the "empowerment" of the people in developing countries. The first objective of the MDGs is poverty reduction. Achieving the MDGs requires not only reducing poverty temporarily, but sustaining poverty reduction efforts. For these purposes, sustainable economic growth is an essential factor. In East Asia, economic growth was facilitated by attracting investment from the private sector and promoting economic activity such as trade through the establishment of an environment for investment, including infrastructural investment. In the past, per capita gross domestic product ( GDP ) in East Asia was lower than that in sub-Saharan Africa, but percapita GDP in East Asia has increased remarkably and is now almost three times that of sub-Saharan Africa. In the period between 1981 and 2001, the per capita GDP growth rate in East Asia has exceeded an annual average of 5.5%, and the population of people living in absolute poverty on less than one dollar a day has been reduced by 400 million. According to DAC statistics, approximately US$2,089 trillion was provided to Africa between 1980 and 2003, in contrast to the approximately US$1,079 trillion received by East Asia, and thus ODA contributed to East Asia's growth with a smaller quantity than that provided to African countries. The experience of East Asia's development demonstrates that economic growth, supported by the inflow of private sector funds and ODA, ultimately contributes to poverty reduction. In particular, the total amount of funds directed at developing countries from overseas accompanying the globalization of the economy in recent years was US$264.1 billion, and US$67 billion of this was provided through ODA (both amounts are provisional, based on DAC statistics, 2003), which accounts for about one-fourth of the funds flowing into developing countries. Prerequisites for poverty reduction through sustainable economic growth by using these funds include the establishment and improvement of an institutional and policy environment, capacity building for the government, good governance, and sound macroeconomic policy administration. Japan will maintain its awareness of the importance of these requirements as it continues to provide assistance through ODA. To achieve the MDGs, it is essential to prevent conflicts and deal effectively with disasters. Conflicts and disasters can instantly wipe out the results of long years' efforts of development, causing enormous economic losses and, as such, pose a major obstacle to achieving the MDGs. The consequences of natural disasters were clearly demonstrated by the damage from the major earthquake off the coast of Sumatra and the tsunami in the Indian Ocean in December 2004. Therefore, securing peace, stability, and disaster reduction of developing countries through efforts against conflicts and disasters is an essential precondition for achieving the MDGs, although that is not included in the MDGs themselves. Japan provides seamless support to deal with conflicts and disasters at various stages ranging from emergency support to reconstruction and development and, by ensuring the peace and security of developing countries, will continue to contribute to achieving the MDGs. 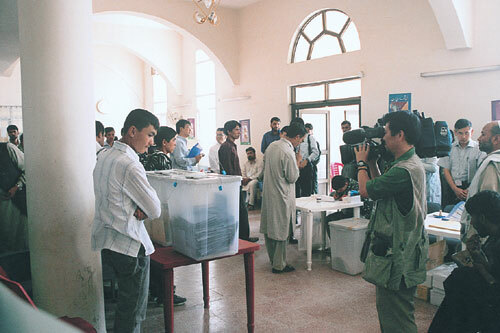 Parliamentary election in Afghanistan. Japan contributes to peace-building in developing countries through democratization by sending election-monitoring groups. According to the United Nations Development Programme ( UNDP ), of the 34 developing countries that are considered furthest away from achieving the MDGs, 22 are either under conflict or in a state of instability of post-conflict. Moreover, according to the same source, disasters caused by conflicts have also led to a worsening of various social development indicators, and among those countries which have just recovered from conflict 40% (60% focusing on Africa alone) have again fallen into a state of conflict. For these reasons, Japan places emphasis on peace-building and has recently been providing assistance to Afghanistan and Iraq. Natural disasters such as earthquakes, tsunamis, and torrential rains are a global concern and can cause serious damage to countries around the world. Developing countries are particularly vulnerable to natural disasters. Measures to prevent and mitigate disaster damages on people's livelihoods and socioeconomic development are an important precondition to achieving poverty reduction and, by extension, to achieving the MDGs. During the 25 year period from 1978 to 2002, over 90% of the people who died from natural disasters were concentrated in developing countries. Having repeatedly experienced various natural disasters such as earthquakes, tsunamis, and typhoons, Japan has accumulated a great deal of experience and technical know-how on measures against natural disasters. As one of the largest donor countries on disaster reduction, Japan will utilize its experience and technology to support developing countries in their efforts to build disaster-resilient societies. Japan has also organized the World Conference on Disaster Reduction and will continuously play a leading role in efforts toward international disaster reduction. Based on the approach described above, Japan's approach to poverty reduction through economic growth is introduced in Section 2. In Section 3, examples of how Japan contributes to the MDGs through support to social sectors that directly benefit the poor are presented.